I read this article and found it very interesting, thought it might be something for you. The article is called Fostering Wanderlust in the Windy City and is located at https://www.medalofphilanthropy.org/fostering-wanderlust-windy-city/. None of his friends or family expected Jahmal Cole to go to college, let alone graduate, but he did; and that was just the beginning. After college, Jahmal returned to his hometown of Chicago as a Microsoft administrator at a trading firm. In the time he had to spare, Jahmal volunteered with the juvenile population at Cook County Jail. For three years, he listened to the children, learning that outside Cook County’s walls much of their experience took place in just one or two blocks. Jahmal spent his time bringing these young people down to see where he worked, showed them alternative career paths and it helped broaden their world view. He started with one or two kids he would drive downtown himself in his car and developed into multiple trips with children piled into vans to see a part of the city they had never seen before. This experience was the beginning of My Block, My Hood, My City (M3). Jahmal and M3 now have over 120 teenagers, from underserved “Level 3” schools (lower performing schools with less than 80% attendance) who they bring on explorations around Chicago to explore and broaden their world view from their block, to their neighborhood, and to their city. 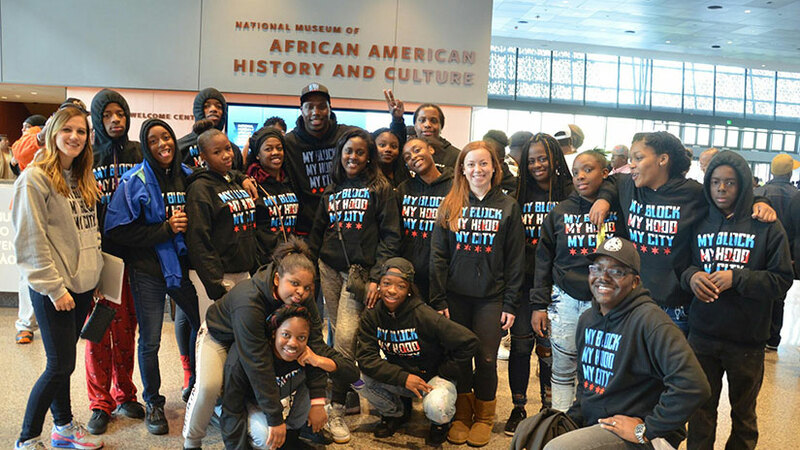 Last year, M3 trekked outside the city and took 25 students to the National Museum of African American History and Culture in Washington, DC, a trip that brought these students their first experiences with boarding passes, airplanes, and travel outside their own comfort zone. This year, their first graduating class will set the stage for the future. Jahmal hopes to show these students that, in a city like Chicago, you can broaden your worldview and bring new options to young people.